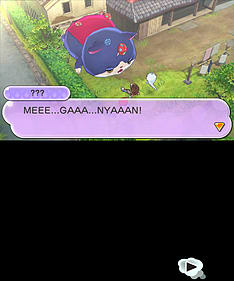 Check out the YO-KAI Watch 2 demo on the Nintendo eShop! Just scan in the QR code above with your Nintendo 3DS. A sinister force has sparked a war between two Yo-kai factions, Bony Spirits and Fleshy Souls, causing chaos throughout the world. Now Nate and friends must travel through time to find out who is behind the evil plot. 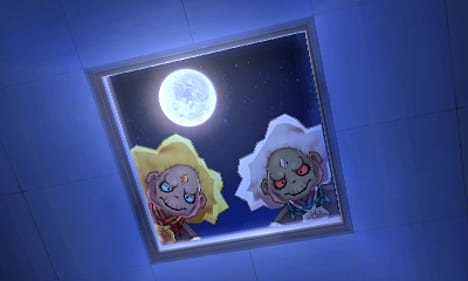 Travel back in time and discover the origin of the first ever Yo-kai Watch! 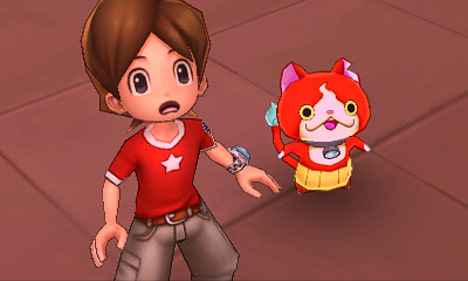 Players can play as Nate or Katie and travel through time and explore highly detailed environments, meet and befriend a collection of quirky and often mischievous Yo-kai, and discover the origins of the first ever Yo-kai Watch. Each Yo-kai has its own unique personality, but they all love to create mischief, doing their best to hide from human eyes. 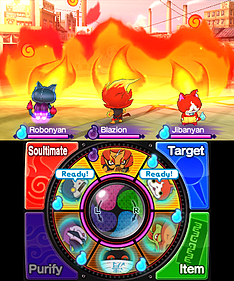 With a little understanding, and with the right food, players can befriend mischievous Yo-kai – both old and new - as they take part in an epic adventure. 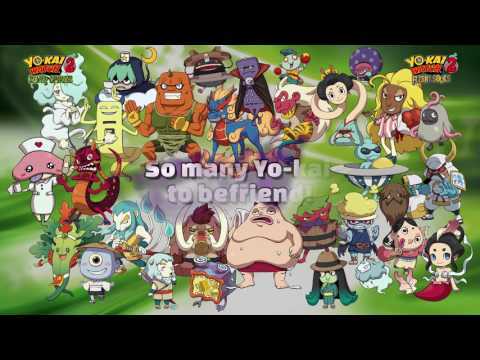 Find, battle, and befriend new Yo-kai! Use the new Yo-kai Watch Model Zero to form a team of Yo-kai friends to take on the bad guys. Along your journey, you will encounter a special Yo-kai named Hovernyan, who shows how to travel through time. You can visit Springdale as it was 60 years ago, travel between different locations, and switch between the past and present in an instant, as they set out to discover the mysteries behind the Wicked Yo-kai. Take on over 80 exciting side quests which involve helping the local residents with their everyday problems. By helping townsfolk, players can discover new Yo-kai and receive useful rewards that will help them on their adventures. Play and trade with friends. For the first time, players can trade Yo-kai Medals online and create a team of their favourite Yo-kai to challenge faraway friends in a fully-featured multiplayer mode. Win or lose, players can earn Battle Points and use these to purchase items from the Official BP Shop that will help to power up and release imprisoned Yo-kai. This unique battle system encourages a friendly and fair multiplayer experience for players of all ages and abilities. And for the first time, players can bring their favourite Yo-kai online to battle others in a number of modes. Bony Spirits or Fleshy Souls? 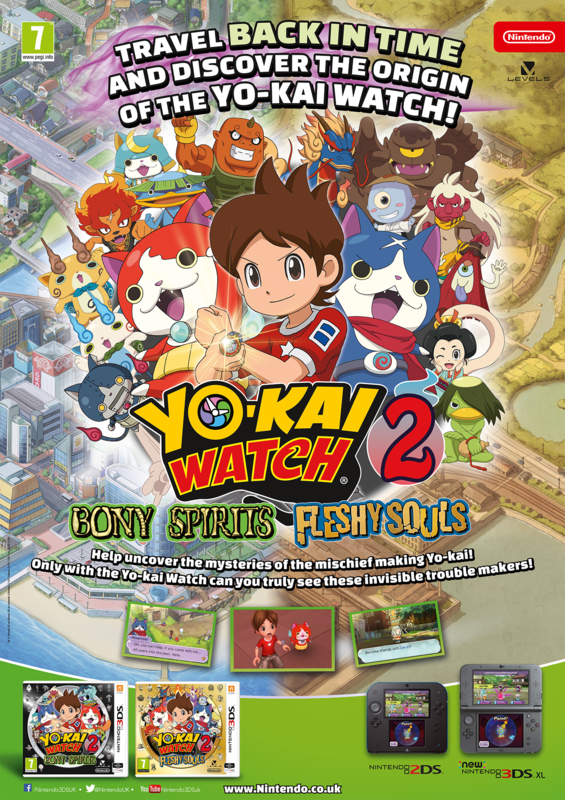 Each version of YO-KAI WATCH® 2 includes five exclusive and unique Yo-kai which can be traded locally and online, and whether a player joins the Bony or the Fleshy army depends on which version of YO-KAI WATCH® 2 he or she chooses. Players can participate in the Fleshy Souls and Bony Spirits rivalry by playing online, winning battles and earning points to help their chosen team emerge victorious in the weekly Bony vs Fleshy army battles.